With summer time knocking on our door (although we have a FROST warning tonight...really?!?!?) it is getting to be time to break out the swimsuits, fun summer towels and sunscreen. Pool days are just around the corner and I know my children have already been begging to be in the pool. Actually, we had a few HOT days here and my children were in the pool and loved it. So, now that it is cool again they are still wanting to swim but poor things just don't know any better. Haha! 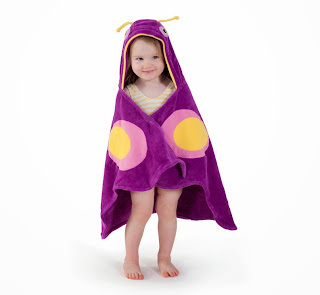 I have never had the opportunity to review a Cotton Hooded Towel from Kidorable so when offered a chance to receive one, I was definitely excited. 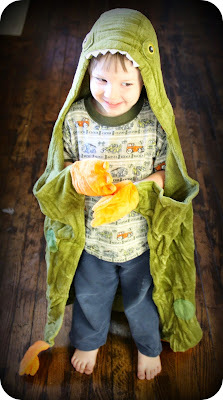 For this review I chose to receive the Dinosaur Towel. 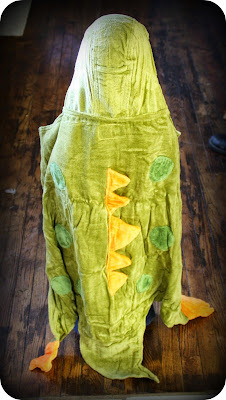 My boys are on a dinosaur kick lately and so this was guaranteed to be a huge hit with them. The towel arrived recently and we were able to check it out...suuuuuuuuuuper cute!! It comes in a heavy-duty, zippered bag and is tied with a Kidorable ribbon, making it ready to be given as a gift. 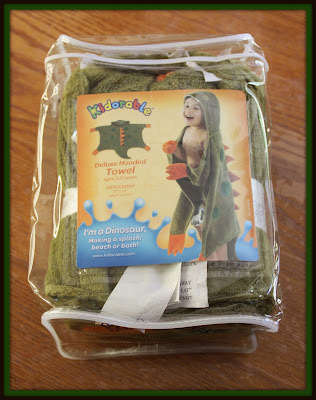 Some of the highlights of this towel are "gloves" that look like dinosaur paws for the child to slip their hands in. This makes wrapping the towel around you after bathing or swimming super easy. Then, there is the "mouth" of the dinosaur, which is actually the hood. It has teeth around the top and two eyes on top of the hood. I love love LOVE the snap closure at the neck line of the towel, so you can bundle up your little tyke and keep them warm. 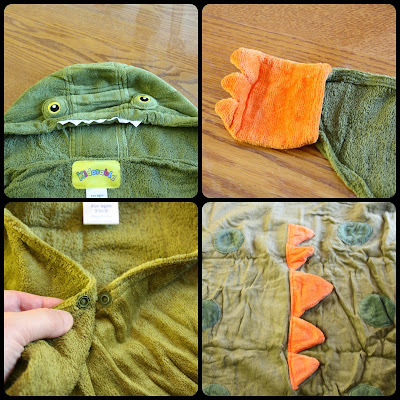 There are also cute little "spikes" that run down the back of the towel, so your child can feel and look like a real dinosaur! My littlest guy LOVES this towel and I had no trouble getting him to model it for me. It is a perfect fit for him!! It touches the ground, which is totally fine because that means he can grow into it a little bit. Isn't it cute?? Really, Kidorable has left no detail out of this towel. I can almost guarantee you that any hooded towel from them will be just as detailed. They truly know how to make quality children's products that kids will embrace and love. This summer, you child will be the hit at the pool or the beach. 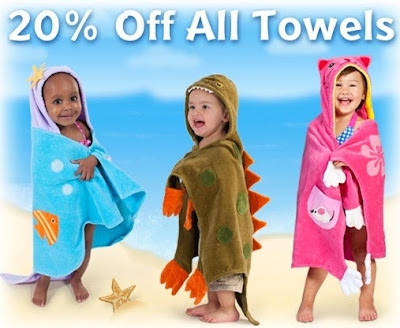 Let them pick out their very own towel and celebrate summer...the KIDORABLE way! Dora! My daughter loves Dora, that umbrella would be a hit at our house. We like the SpongeBob SquarePants Umbrella. My son would love the dragon knight umbrella. My daughter would love the Ladybug umbrella! I like the space hero one. I like the Frog and the Ladybug umbrellas. I'd love to win the frog umbrella. I think my daughter would like the ladybug umbrella from Kidorable. 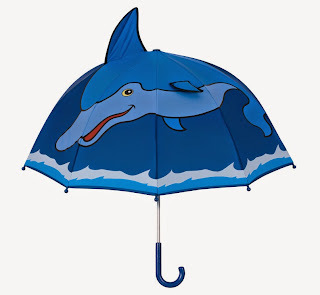 MY girls would love the mermaid umbrella. The Space Hero umbrella would be awesome for my kids! I like the Lucky Cat Umbrella, it is cute. I love the ladybug umbrella. Thanks for hosting! The frog umbrella is adorable! I love the ladybug umbrella. I love the frog umbrella.